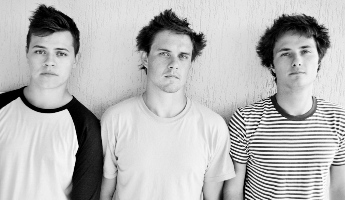 "The Atlantis is a three-piece alternative rock band from NSW, Australia. The group, formed in 2010, consists of Glen Gustard (Guitar & Vocals), Mitchell Thompson (Bass & Vocals) and Jeff Brown (Drums). Driven by a transfixing guitar melody, The Atlantis has a progressive rock feel with catchy harmonies and clever lyricism. The Atlantis has released 5 songs, recorded at Grove Studios (most notably known as the studio where artist’s such as Silver Chair, Short Stack and Birds of Tokyo have previously recorded) that are available to download free of charge on their website: www.theatlantis.com.au"
In 50 years musicians will be able to think of music and transfer them from their minds wirelessly into a future program called Awesome-tools. Okay maybe thats 52 years. Music is so accessible these days you can turn on your computer or smart phone and find a new band in an instant from any genre of music you like. I think as the world gets smaller, music will only continue to expand and grow in new and exciting ways. The hard thing is artists will have to get smarter and find new ways as a business side to make money off their music such as showing exclusive film of the band and new material to premium subscribers and interacting more with their fan base with meet and greets and what not. In Australia there is a very little underground scene for small bands and bands that are just starting, especially when there are thousands of bands trying to do the same thing, it's hard to get exposure. Within saying that it just makes it a more exciting challenge to be more creative and be the best you possibly can be. Yes of course, all 3 of us would. The feeling we get from creating music is phenomenal. Not that we would push them into doing it but they will be the greatest musicians in the world by the age of 3. Freddy Mercury. But if it ends up failing, we have all had very good practice at plants vs zombies.